GéNIA (born 1972) is a Russian “concert pianist, educator and producer. 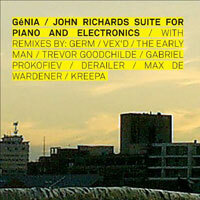 Known for her contemporary and classical music concerts as well as commercial multimedia events.” John Richards (born 1966) is a British electronic music composer who has been working since the 1990s. Their Suite for Piano and Electronics is comprised of two short pieces that are a pleasure-inducing exercise in sublime subtlety. Punching in at just 5:22, the “Prelude” does its best imitation of a Qualude by setting aloft a slowly circling mist full of super sparse, minor note-littered piano playing and quiet, chattering electronics. The nearly 11 minute long “No. 2.” gently belts out a rumbling piano cloud that suddenly segues into rippling arpeggios that will tickle your midnight atmospheric fancy just fine. You are currently browsing the archives for the Génia category.